Join the Quilt Addicts Anonymous 2018 Block of the Month designed by Stephanie Soebbing! Dimensions is an 11-month block of the month program that runs July 2018 through June 2019. 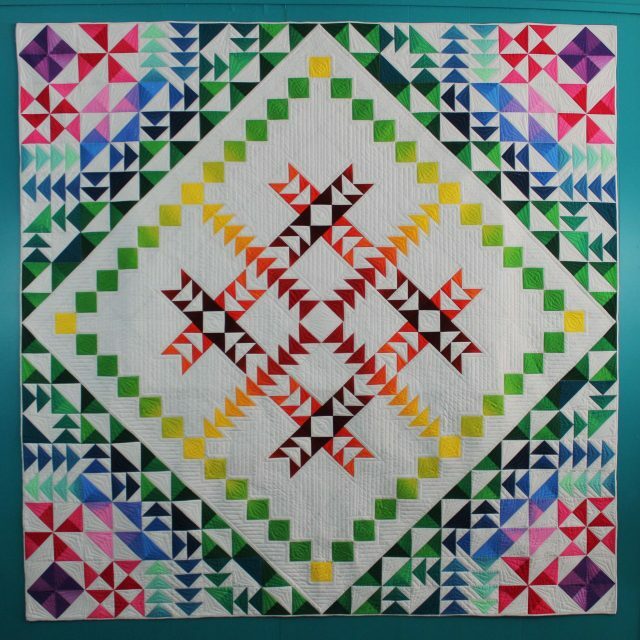 There are 11 block designs and the quilt will measure 80-inches square when completed. The quilt uses Kinkame Shades and American Made Brand Solids by Clothworks. Each month you will receive one ombre fabric and one solid fabric to make that month’s block design with. The color change happens naturally when you cut the fabric apart. When you join the Dimensions Block of the Month program, you will pay a $25 sign up fee, which covers the cost of the pattern book, and $19.99 plus shipping each month. The pattern book will have full color instructions from cutting through final assembly. We anticipate that first block will ship the first week of July.